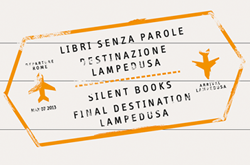 Silent Books: Final Destination Lampedusa On the Move again! In this issue of our Newsletter, you will find news from the national sections of Armenia, Germany, Greece, Italy, Slovakia and The Netherlands. News of an exciting project, based on the Silent Books exhibition, thanks to cooperation between IBBY UK, IBBY Italy and IBBY France – a full report is in this Newsletter. SAVE THE DATE! The IBBY European Conference: "Bridging worlds: reaching out to young refugees with books and stories" will take place on Thursday, 6 April 2017 at the Bologna International Children's Book Fair. Read more about this event below. The IBBY Europe website: this website, which recommends books selected by the National Sections in Europe, will also start to include recommendations of books in languages spoken and read by the refugee and migrant children. The selection will be online for the Conference in April. The IBBY Europe Facebook page: a big 'thank you' must go to Wally De Doncker for his excellent work behind the scenes making our Facebook page so popular with his great choice of posts! This page is yours – please use it to promote the work of your National Section. For six years, David Pintor has been creating the beautiful headers for each issue of our Newsletter, we owe him a lot! And Liz Page has been proof reading every issue, not an easy task... A huge thank you to both of them! Enjoy reading the newsletter, and best wishes to you all! We are delighted to invite you to our first European Regional conference. The Conference will focus on the theme of young refugees, which is an idea that developed from the discussions at the Open Forum held during the IBBY Congress in New Zealand. The Bologna Fair organisers will provide the venue and refreshments, so there will be no registration fee for the event. They have also offered to assist participants with finding accommodation. The programme will include an overview of the current situation worldwide, and there will be three panels looking at issues related to libraries, to books and to the Silent Books collection. Opportunities for the NS to share activities and learn from each other will be present. We also aim to develop a section on the current IBBY Europe website for sharing information and looking at future activities. Send us information about any books that you find useful when thinking about the migration experience – including any author or illustrator that you think would be important to invite to the meeting. And finally, please let us know how many members from your section will be likely to attend this event. Let us know an idea of how many members from your section will be likely to attend this event. 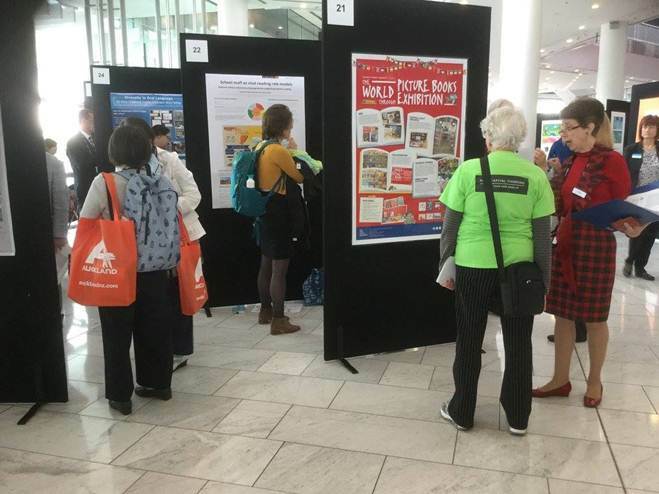 Here are some pictures of the 35th IBBY International Congress in Auckland, 18-21 August 2016. For more pictures and videos, please visit the Congress Facebook page. 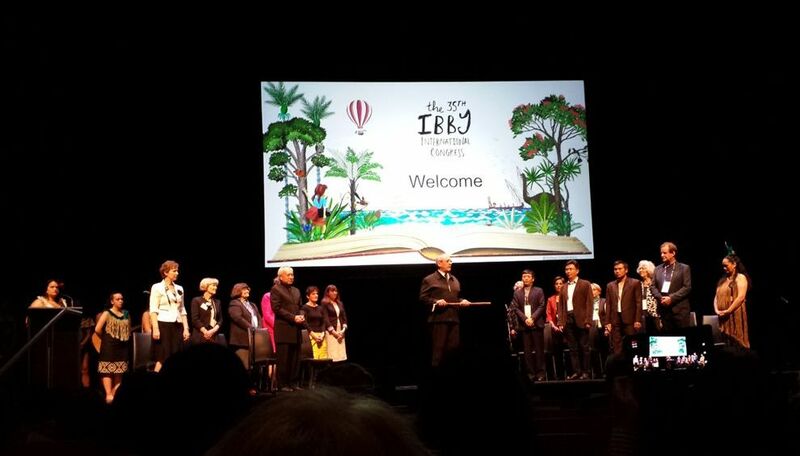 The opening ceremony of the 35th IBBY International Congress in Auckland. 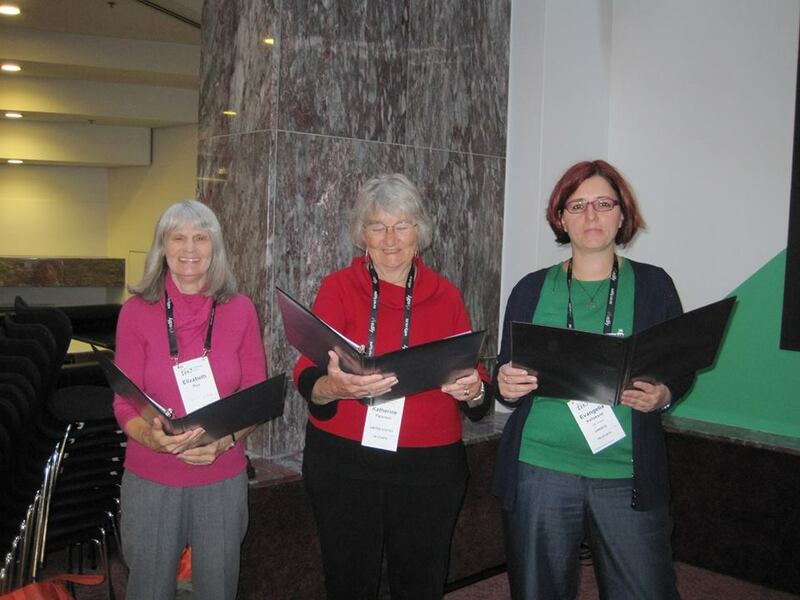 At the back, from left to right: Ferelith Hordon (UK), Carole Bloch (South Africa), Zohreh Ghaeni (Iran), Maria Cristina Vargas (Mexico), Anastasia Arkhipova (Russia), Ellis Vance (IBBY Treasurer, USA). 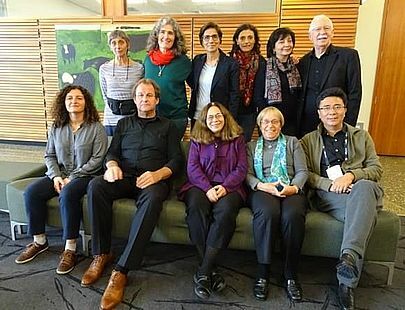 At the front, from left to right: Hasmig Chahinian (France), Wally De Doncker (IBBY President, Belgium), Evelyn B. Freeman (USA), Serpil Ural (Turkey) and Mingzhou Zhang (China). Not in the picture Patricia Aldana (Andersen Jury President 2018, Canada), Liz Page (Executive Director, Switzerland) and Sunjidmaa Jamba (Mongolia). The Jenny Smelik-IBBY prize is named after the children's book author Jenny Smelik who died in 1980. It is given every two years to the author and/or illustrator and/or instigator of a children's book that has contributed to a better understanding of minorities, especially ethnic minorities. The prize consists of 2,000 euros, and an honorable mention is awarded 500 euros. From the Jenny Smelik-IBBY jury’s report: "The main themes are origin and ethnic identity, set in a non-pessimistic light. In fact, Sjoerd Kuyper’s story reads as a tribute to life in Curaçao and the beauty of people connecting across the continents. (…) De duik is a strong proof of stylistics, in which Kuyper experiments with different genres. (…) Kuyper’s evocative narrative is supported by Sanne te Loo’s lively illustrations taking the book to another level and drawing one into the story. Whether in colour, black and white, painted, or cartoonish, her artwork is astonishingly effective and precise, while leaving plenty of room for the imagination." (from the Jury Report) . Sjoerd Kuyper (b. 1952) made his writing debut in 1974 with a collection of poems for adults. He wrote various stories for television, among them Majesteit, Uw ontbijt (Your Breakfast, Sire) and Het zakmes (The Pocket Knife) which was also filmed and received fourteen awards, among them an Emmy. In 1994 he won a Silver Slate Pencil for Robin en Suze (Robin And Suze), in 1995 he won another for Het eiland Klaasje (The Isle of Klaasje). In 2012 he was awarded the Theo Thijssen Prize for his oeuvre. He is, he thinks, a writer who writes mostly about what he thinks, fears, feels, more than about what he himself has experienced. 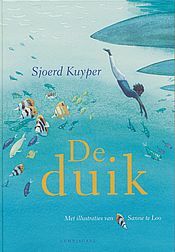 Kuyper writes in a style that is poetic, clear and vivid and enters with ease into the emotional world of young children. 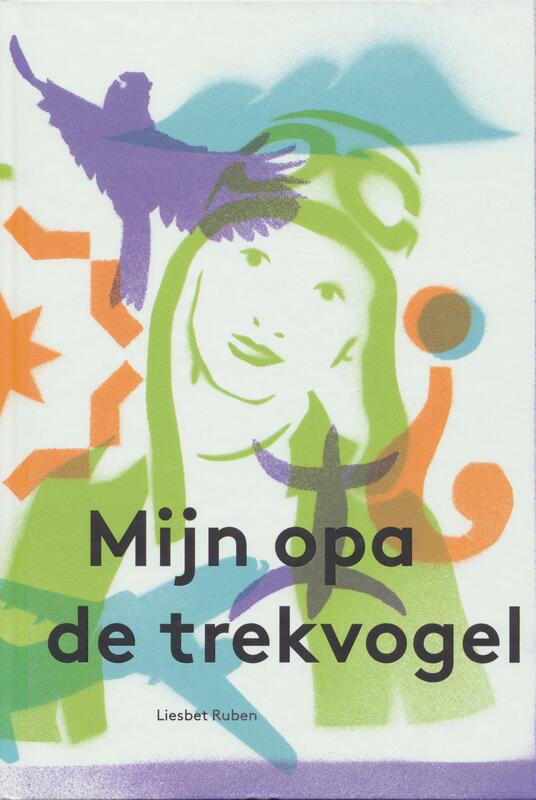 Furthermore, the jury awarded an honorable mention to author Liesbet Ruben for her informative book Mijn opa de trekvogel (My grandfather the migrant), published by Tropenmuseum junior/Leopold. The jury stated "The Jury is especially charmed by the fact that interest in others is the driving force behind the plot. For Adam, his grandfather and their acquaintances mutual understanding and empathy are an obvious way of life, stimulating diversity. The perception of the Moroccan community in the Netherlands is depicted in a natural and self-explanatory manner. Adam and his grandfather’s identity is a theme without becoming a problem. If anything, the dignity of being Moroccan is emphasized, as well as the importance of keeping in touch with one another." (from the Jury Report). This is the 4th year that the Armenian National Section of IBBY , together with the National Children's Library after Khnko Aper, has celebrated the ICBD. This year we organized various interesting and entertaining events. 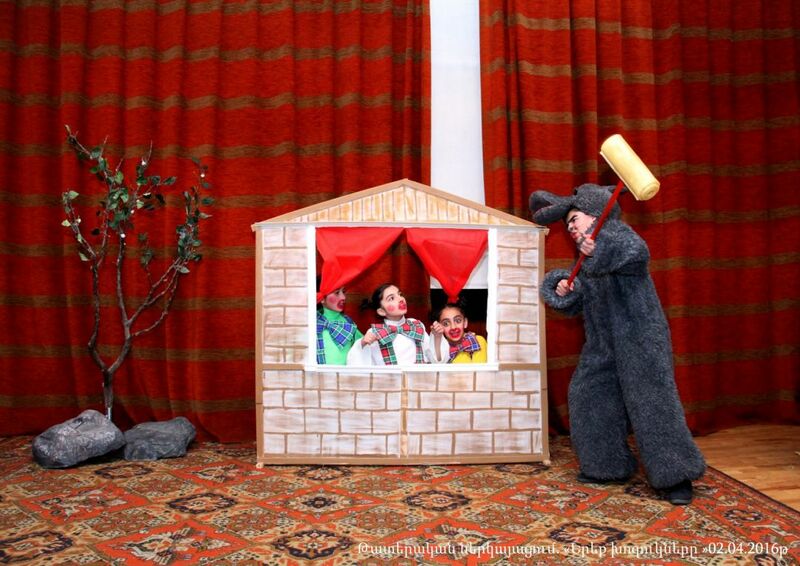 There was a performance titled “Fairy tales’ casket” for the little story lovers, also there was a presentation of a new children’s book titled Հասկեր (Hasker, Wheat ears) by Edit Print Publishing House. During the day there were also other events such as reading aloud hours, storytelling and book discussions in the library. In 2015 the Armenian National Section of IBBY with the support of IBBY Yamada Fund 2015 launched a contest/workshop project entitled “Young adults and the environment” for the Armenian writers and illustrators. During that project a contest was announced for our young and middle-age writers and illustrators the aim of which was the creation of a book (titled “7 colors”) for young adults with the best joint works of writers and illustrators. Workshops both for writers and illustrators were also organized as part of the project. The workshop for writers was run by German writer Manfred Theisen and the workshop for illustrators was run by Belgian illustrator Klaas Verplancke. This year the Armenian National Section of IBBY with the support of IBBY Yamada Fund 2016 launched the continuation of the contest/workshop project entitled “Young adults and the environment”. 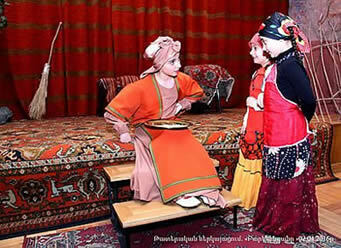 A contest and a workshop for Armenian translators of literature for children and young adults was organized. On 18-20 May 2016 the British writer, translator and editor Daniel Hahn ran a 3-day workshop for Armenian translators. The workshop gave the 15 participants the opportunity first of all to exchange experiences, to discuss the international current trends in translation of the literature meant for children and young adults with a professional from abroad. This newly gained knowledge and professional skills in translation work will certainly help the participants. In June the jury and Daniel Hahn selected the best translators from among the 15 participants. The winners will translate (into English) the stories included in the book "7 colors" that was published during the 2015 project. The English version of the book will be published and presented to Armenian young readers at the end of 2016 and presented at the Bologna Book Fair 2017. On the occasion of the World Book Day, the Association of Greek Publishers and Booksellers launched a big campaign named “Read & Change”. 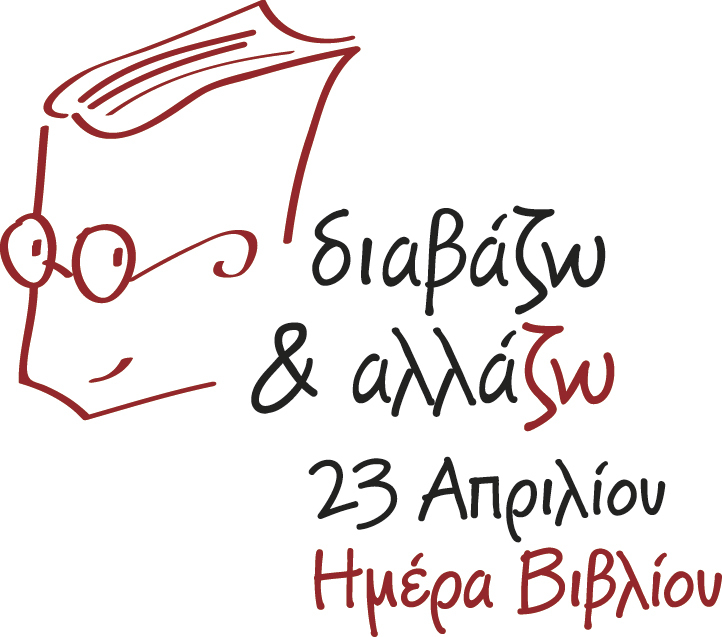 In cooperation with the Hellenic Authors’ Society, the Greek Section of IBBY cooperated and participated in the specially organized events from 2nd to 23rd April, 2016. More specifically, book events and workshops took place in libraries, schools, book clubs, publishing houses etc. The events peaked with a Book Walk around bookshops in Athens which remained open till late at night. On behalf of the Greek Section of IBBY, the authors Vagelis Iliopoulos and Athina Biniou visited the oncology hospital “Hope” and read excerpts from Georges Sari' s children’s books. The Greek Section of IBBY participated in the 13th International Book Exhibition in Thessaloniki in May 2016 having its own stand. 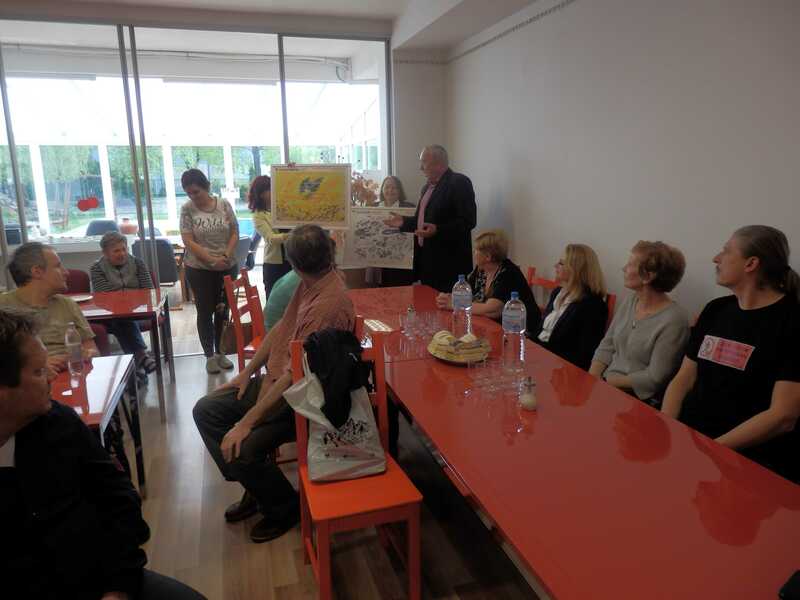 The visitors were given the chance to get useful information for IBBY Greece’s activities, get posters and bookmarks related to the anti-bullying campaign, the International Children’s Book Day 2016 and the campaign “Read & Change”. The visitors participated in the activities“A word for little refugees” and “Once upon a time…”. 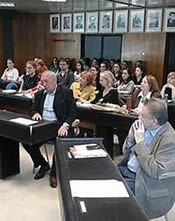 In parallel, there was a workshop for children named “Read & Change” and a seminar for teachers on the topic “With the books on your side, say to violence ‘step aside’ – Using children’s literature to deal with the phenomenon of bullying at schools” in collaboration with the Aristotelian University of Thessaloniki. 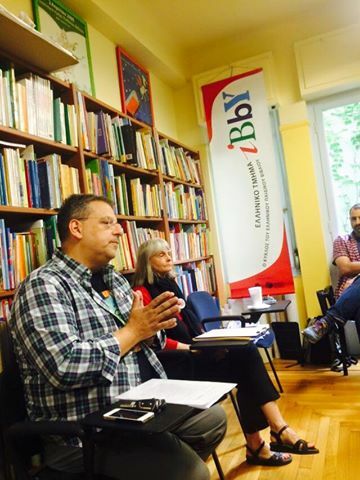 The 1st educational seminar for the Reading Activists group took place in IBBY Greece premises in May 2016. 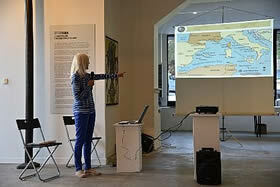 The seminar was held by Dr. Elizabeth Poe (Author, Children’s/Young adult literature Consultant, USA) and the coordinator of the group, Vagelis Iliopoulos (Author). 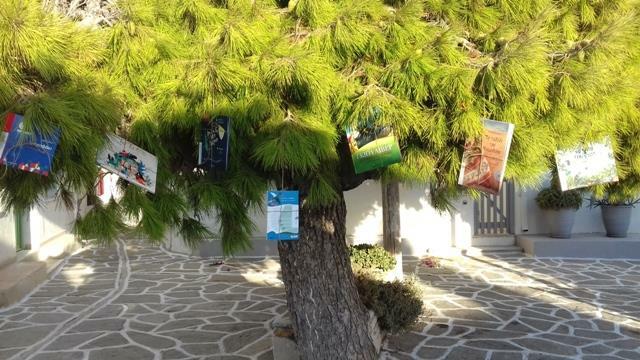 The Greek Section of IBBY participated in the cultural festival “Routes in Marpissa” organizing the activity “A Journey to the Pages of the Most Bizarre Book” based on children’s literature books which are related to sea journeys and travelling on a boat. After the end of the festival, the books were donated to the Primary school of Marpissa as part of the activity “Read & Share”. "Engaging Greek children with books by HCA Award-winning authors via Readers Theatre"
The Vice President and Liaison Officer of IBBY Greece, Eva Kaliskami, participated in the congress events where she also presented the paper "Engaging Greek children with books by Hans Christian Andersen Award winning authors via Readers Theatre", with Dr. Elizabeth Poe (USA) and Katherine Paterson (USA). 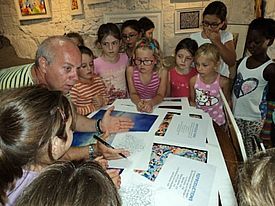 In collaboration with the Municipality of Kallithea and the Network for Children’s Rights, the Greek Section of IBBY participated in the events celebrating the 2016 European Cultural Heritage Days for the second consecutive year. 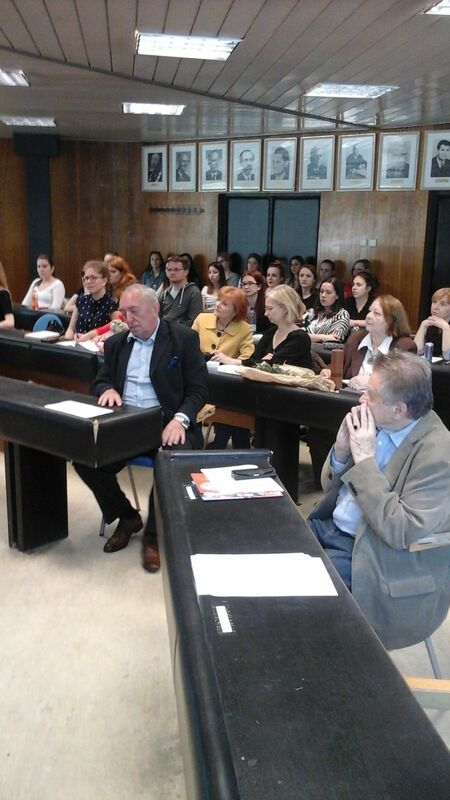 “YES to Tolerance – NO to Violence: Literary Narratives for Refugees” was the theme of the event organized by IBBY Greece. More specifically, the event was based on the narration of literary excerpts by Greek authors who are also members of IBBY Greece and their work refers to “persecution and refugees” in Greek, Arabic and Farsi. 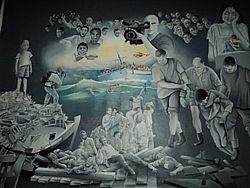 At the same time, the audience participated in the event through the activity “A Thought and a Word for the Refugees” leaving its mark on the “Ship of Tolerance”. Τhe event brought writers, educators, refugees, parents and a crowd of enthusiastic young children together to celebrate tolerance and denounce violence through story-sharing activities. IBBY Germany now on Facebook! We are happy to announce the launch of our official Facebook page with news from the German IBBY section/Arbeitskreis für Jugendliteratur! 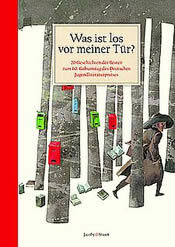 This year, the German Children's Literature Award (Deutscher Jugendliteraturpreis) is celebrating its 60th anniversary. Since 1956 the prize has been given annually to outstanding works of children's and young adult literature. From the beginning it has always been an international award, thus, books from all languages are eligible – provided that they have been translated and published in German. 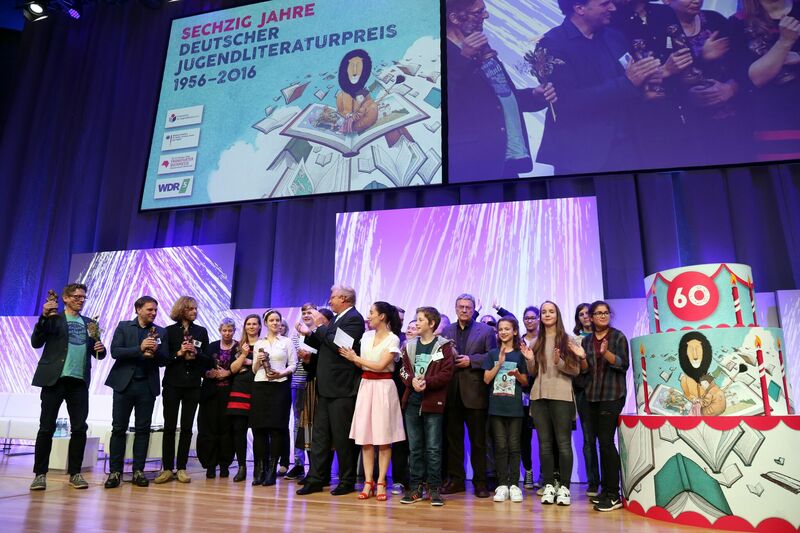 On 21 October 2016, Dr. Ralf Kleindiek, State Secretary at the German Federal Ministry for Family Affairs, Senior Citizens, Women and Youth, announced this year's winners during a ceremony at Frankfurt Book Fair. The jury of literature specialists and critics awarded the following books: In the category picture book Der Hund, den Nino nicht hatte (Bohem Press; original title: Den hondje dat Nino niet had, Eenhoorn; English version: The Dog That Nino Didn't Have, Eerdmans Books for Young Readers) written by Edward van de Vendel, illustrated by Anton van Hertbruggen and translated from Dutch by Rolf Erdorf; in the category children's books Das Mädchen Wadjda (cbt Verlag; original title: The Green Bicycle, Puffin Books) by Hayfa Al Mansour, translated from English by Catrin Frischer; in the category young adult books Mädchenmeute (rowohlt; title in English: Girl Pack) by Kirsten Fuchs; in the category non-fiction Im Eisland. Die Franklin-Expedition (Hinstorff; title in English: In the Land of Ice. The Franklin Expedition) by Kristina Gehrmann. 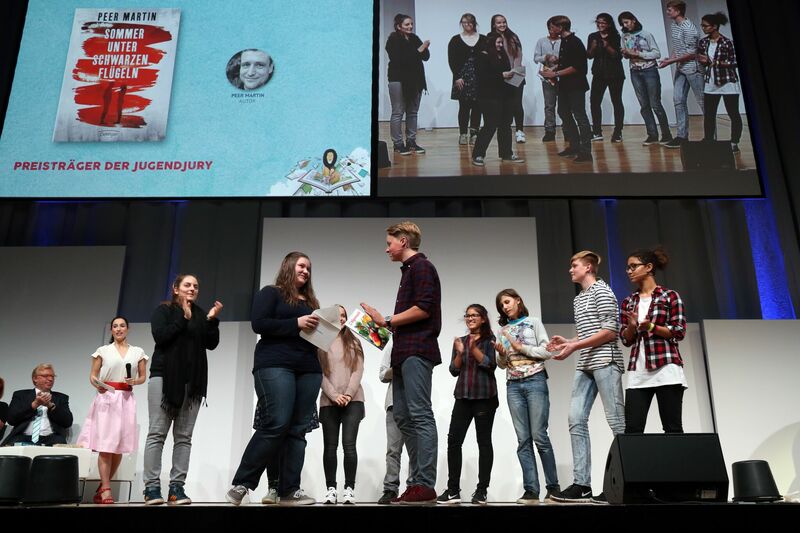 The young adult jury, which consists of six reading clubs from all over Germany, honoured Sommer unter schwarzen Flügeln (Oetinger; title in English: The Summer of Black Wings) by Peer Martin. All five categories carry a value of 10,000 Euros. 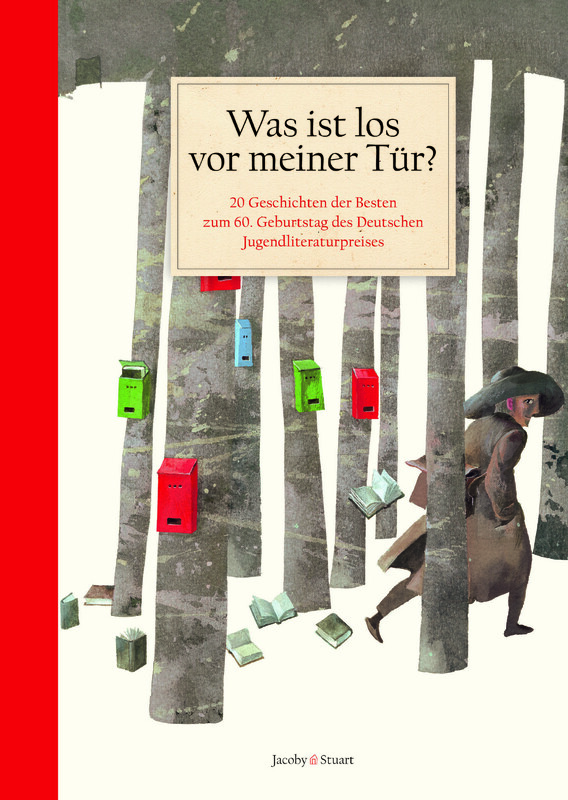 To mark the German Children’s Literature Award’s 60th anniversary, an anthology with stories by 20 past awardees was published under the title Was ist los vor meiner Tür? (What Is Going on in front of my Door?) in August 2016. Authors from all over the world have contributed to the volume: Martin Baltscheit, Kirsten Boie, Davide Calì, Vincent Cuvellier, Inés Garland, Peter Härtling, Susan Kreller, RoseLagercrantz, Marjaleena Lembcke, Bart Moeyaert, Iva Procházková, Mirjam Pressler, Maris Putninš, Jutta Richter, Jenny Robson, Andreas Steinhöfel, Tami Shem-Tov, Shaun Tan, Toon Tellegen and Robert Paul Weston. The stories are about diversity, open mindedness, tolerance and living together peacefully. They have been illustrated by prize winner Aljoscha Blau. "Was ist los vor meiner Tür?" On Thursday, 20 October 2016, IBBY hosted a panel session at the Frankfurt Book Fair focusing on the 2016 Hans Christian Andersen Awards. 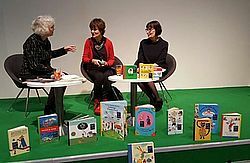 Liz Page discussed with the German illustrator Rotraut Susanne Berner, winner of the 2016 Illustration Award, and Dr Susanne Helene Becker, President of IBBY Germany/Arbeitskreis für Jugendliteratur. Promoters of reading all over the world agree: A child’s first contact with a book should always be in its native language. Demand for bilingual books is enormous, but unfortunately there are very few available. 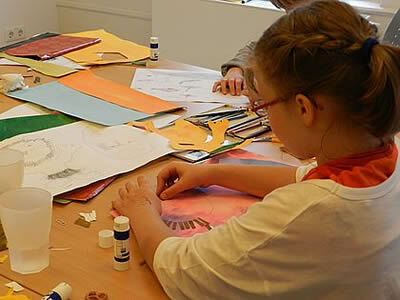 To change this, the reading club Bücherpiraten (Book Pirates) from Lübeck, Germany, invented a special project: They invite children to create bilingual picture books with them. 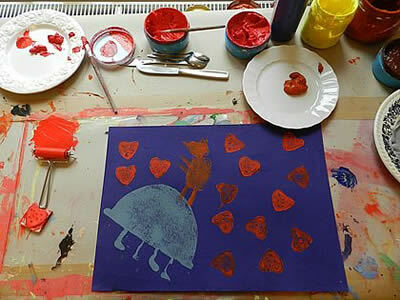 To kick off the project, Bücherpiraten organized workshops giving children the chance to work on their own picture book. 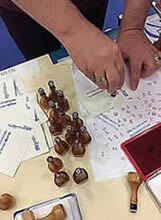 After the workshops, the books were translated by professional translators into six base languages: Arabic, English, French, Mandarin, Russian and Spanish. Using the seven language versions as a basis, a whole slew of volunteer native speakers translate the stories into as many languages as possible. So, the number of language combinations is growing more and more. Families and promoters of reading from all over the world have the possibility to download the books for free in two optional languages. The aim of the 1001 language project is a database full of bilingual books written by children, for children. 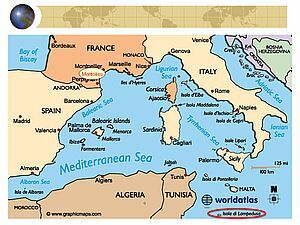 Promoters of reading from all over the world are invited to upload stories created by children. Project coordinator Martin Gries explains: “We check the new stories and let them translate into different languages. The more the merrier.” Volunteer native speakers willing to translate the books into their mother tongue are also welcome to get in touch with the Bücherpiraten. 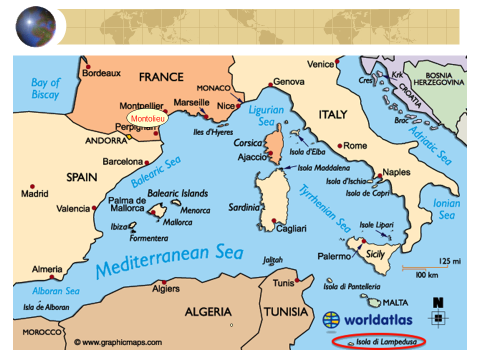 Once again IBBY Italy would like to ask for your support and your collaboration for the third edition of the international project Silent books: Destination Lampedusa. The IBBY project that collects the best picture books published without words. 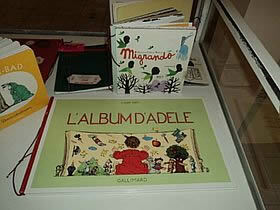 As you know the previous the Silent Book collections have been invaluable for the creation of the children’s library in Lampedusa, they have been the basis for the two travelling exhibitions that are being shown around the world, and have also formed a research collection at the Palazzo delle Esposizioni in Rome. The travelling exhibition is a wonderful IBBY programme that can give support to the many projects that are designed to help refugee children and their families in different countries. For more information, please write to: ibbyitalia@gmail.com. 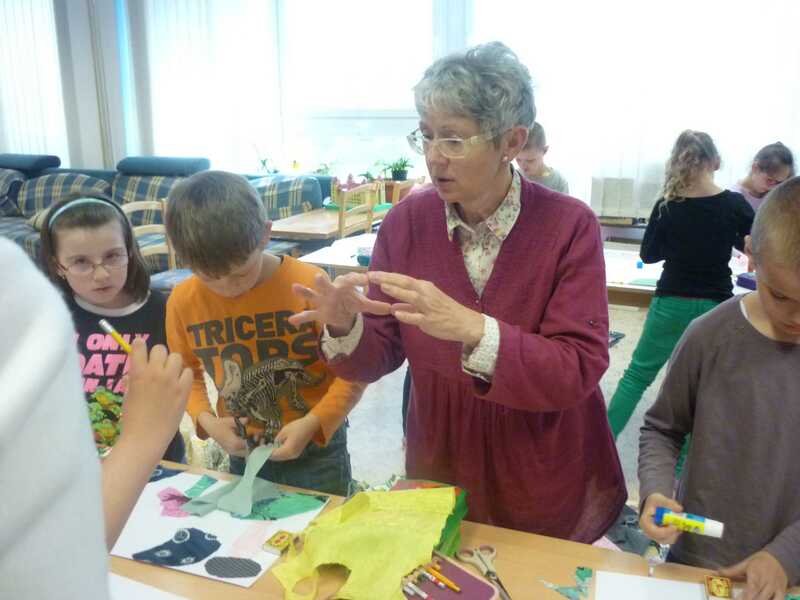 This annual event that took place on 20 April 2016 was organized by SKBBY and BIBIANA, the International House of Art for children, in cooperation with the Faculty of Pedagogy of Comenius University in Bratislava. The seminar is an important specialized platform for members of the academic community, teachers, authors, illustrators, publishers and university students (future teachers). The aim of the seminar is to evaluate the past-year’s book production; the tradition is to have separate evaluations for the literary standard of texts and for the illustration and design. Special attention was paid to the quality of the past year's theatre production for children and youth in Slovakia; the evaluation covered all types of theatre forms and permanent stages. Similar attention was paid to radio production for children (radio monologue stories and plays). During the seminar the Ľudmila Podjavorinska Honorary Plaque 2015, granted by SKBBY for extraordinary contribution to promotion of Slovak culture for children and youth, was presented to Professor Svatava Urbanová from the Czech Republic who also presented an evaluating overview of Czech book production for children and youth in 2015 at the seminar. The Children’s Book Days festival took place on 3-5 May 2016 to mark the festivities of the International Children’s Book Day (IBBY). This travelling festival started 33 years ago. Every spring one of the Slovak libraries hosts a several-day festival. The festival activities include introduction to the local community of representatives of all professions working in the SK IBBY, namely authors and illustrators of children’s books, journalists and various professionals who have children’s book-related jobs. They visit schools, kindergartens, participate in festive programmes/shows, discussions, competitions, literature and illustration workshops and a national seminar on reading. All this is done to promote the message of International Children’s Book Day. The message is translated into Slovak and promoted on this occasion. The festival also is an opportunity to present IBBY and SK IBBY activities throughout the regions of Slovakia. The Petržalka local library took the baton and hosted the festival for the first time in its 33-year history. 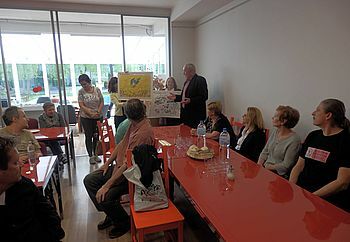 Participants - speakers and artists invited to a cafe Better World provided by the social institution for people with special needs. 43 discussions and workshops with authors and illustrators in Petržalka schools, kindergartens and branches of the Petržalka local library, the BAB Animation Express, the Big Reader Olympics, the national seminar On the Way to the Readers/with the Readers and several exhibitions of illustrations. In addition, there was the opening of a new branch of the Petržalka local library for children in the local hospital. 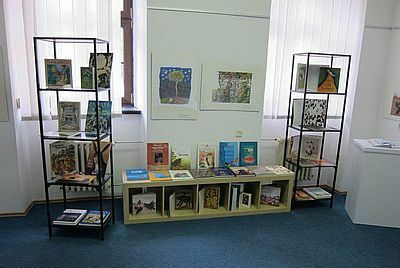 The new branch houses a permanent exhibition of copies of award-winning illustrations from the Biennial of Illustrations Bratislava. The aims of the festival include encouraging reading within the community. For that reason a specialized seminar is one of the features of the festival agenda. This year the seminar was planned to encourage librarians, teachers, parents and all adults who work with children and youth to find more lasting ways to the readership, to know how to develop children’s inner motivation to cultivate their perception, and to evoke their interest in the variety of what they have read. 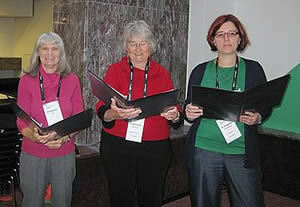 There were six presenters at the seminar who discussed issues related to all age groups of children and youth. Attention was also paid to reading for toddlers. The seminar included a display of reading combined with motion, which is one of the methods used to activate perception in children. This method has been successful also with children with a "schematic-thinking tendency". The Big Reader Olympics was included in the past four years of the festival agenda. The activity is not a competition in knowledge of literature but it is a reader contest checking perception with understanding of the text, attention, focus, speed and quality of reading and oral and writing skills. 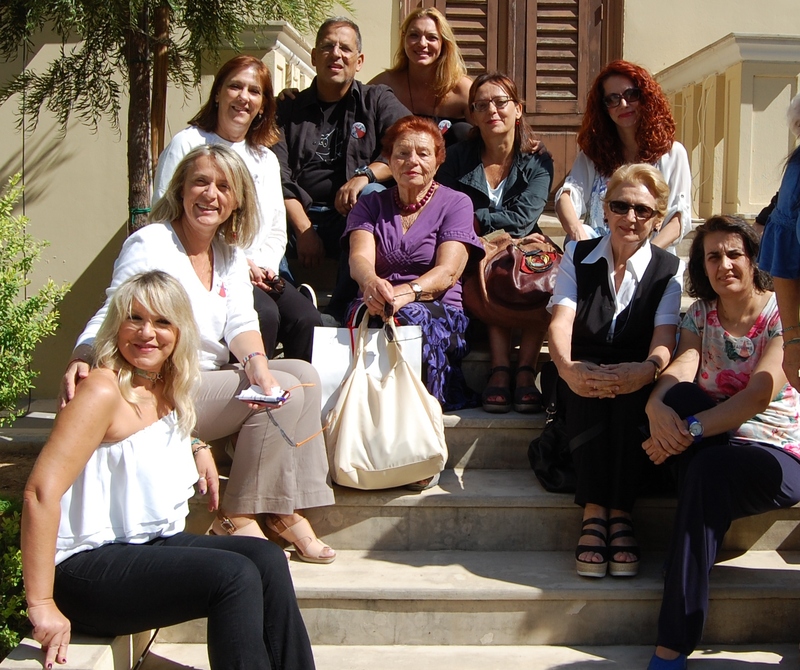 The organizers of this year’s festival focused on the quality of book production. 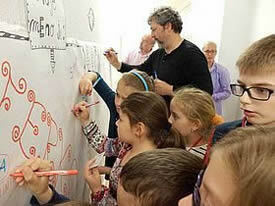 Children had opportunities to meet with the authors and illustrators who won awards in the two last years of the competitions for The Best and the Most Beautiful Books of Spring, Summer, Autumn and Winter (organized by BIBIANA, The International House of Art for Children, and the Slovak IBBY Section). A festival with this kind of focus is a valuable opportunity for our producers of books for children and youth to meet their readers face-to-face in various regions of Slovakia and also to meet with those who use children’s book in their work. The local community can also benefit from the exceptional opportunity to get to know those who are developing the book culture for children and youth. The credit goes to BIBIANA, The International House of Art for Children, for installing its timely exhibitions that present the book production during the festival. This exhibition presented fairy tales from the European Union. It outlined the similarities and inter-connections between national cultural traditions along with their common ground in European spiritual culture. The origins of most European fairy tales go back to Early Medieval pre-Christian communities and there are some ethnologists who believe that some of them even derive from the common Indo-European background. The exhibition presented 28 fairy tale illustrations which have won awards at an event given by BIBIANA or SKBBY, namely the Biennial of Illustrations Bratislava, The Most Beautiful Books of Slovakia, and the quarterly competition for The Most Beautiful and the Best Children’s Books in Slovakia, as well as the IBBY Honour List. The exhibited illustrations were accompanied by more than a hundred of the most representative book titles of European fairy tales from the unique collection of the BIBIANA Library. 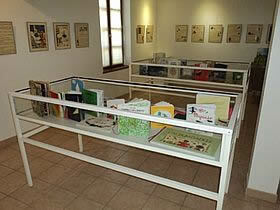 The exhibition was arranged to offer visitors comfortable spaces to read the selected stories. The exhibition was not only based on the European tradition of fairy tales, but it also offered the visitors books that had been published in various countries, in many European languages and illustrated by artists from multiple countries. The exhibition included an interactive map of the European Union. 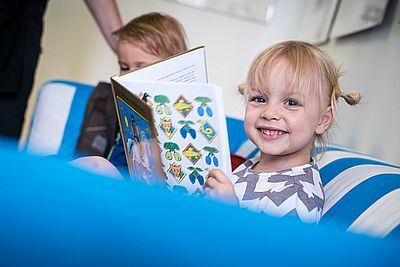 Children could test their knowledge of geography and, above all, discover known and less-known fairy tale stories from Portugal to Estonia, from Sweden to Malta. 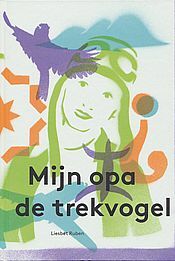 They could also use a guidebook about European fairy tales that was produced especially for the exhibition to help identify the characteristic fairy tale from a certain country, attach a magnet with the relevant illustration and find the country on the map. On 30th June 2016 we gave the traditional awards for winning books of each quarterly season. Every year SKBBY sets up a three-member jury to evaluate the best books (literary qualities) and the most beautiful books (illustrations) throughout the year. The evaluations have been growing ever more popular with publishers and the public alike. The aim of the award is to work as an incentive for publishers to produce quality books. The award is granted by SKBBY and BIBIANA, the International House of Art for Children. 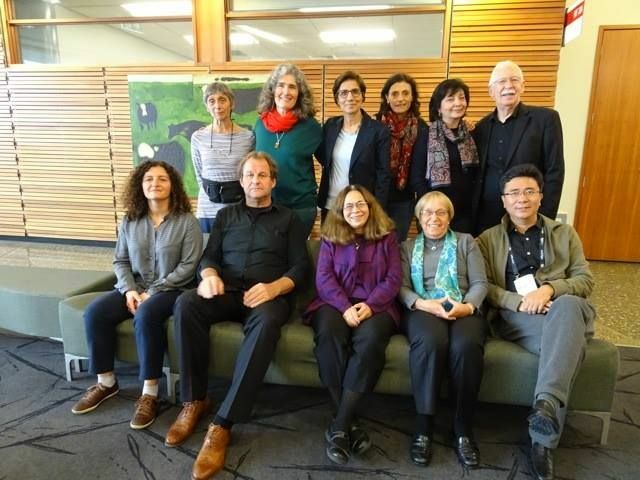 After initial discussions with the association Montolieu Village du Livre – Musée des Arts et Métiers du Livre, things moved at a rapid pace with help from Hasmig Chahinian (IBBY France) Deborah Soria (IBBY Italia) and Liz Page, IBBY’s Executive Director. 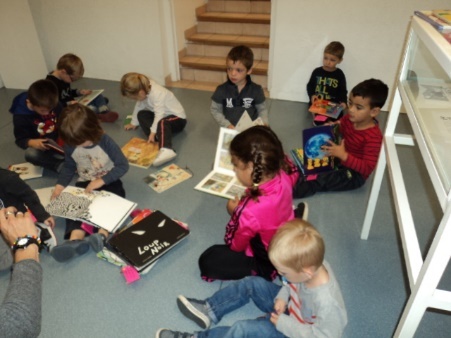 In what seemed like no time at all, the 108 books in the first silent book collection arrived in Montolieu, were ‘read’ by Penni and distributed (according to suitability) to the three primary school classes and the library. The teachers and librarian then explained to the pupils why the collection had been created and, over a period of six weeks, shared the visual narratives with all the primary school children in Montolieu. 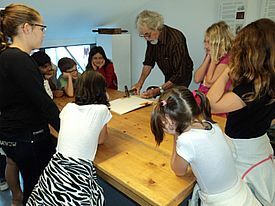 The 108 wordless picture books from around the world were available at all times for the children to read alone or share with their friends and, at the end of the project, were displayed by the Association Montolieu Village du Livre in the Musée des Arts et Métiers du Livre for the general public to ‘read’. As well as reading the visual stories, the idea began to develop of creating three wordless picture books (one per class) for the library in Lampedusa. 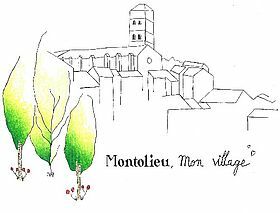 These books, it was hoped, would tell the children on the other side of the Mediterranean a little bit about Montolieu. The chief protagonist in this part of the project was ‘Harillo’, creator of the painting Lampedusa. 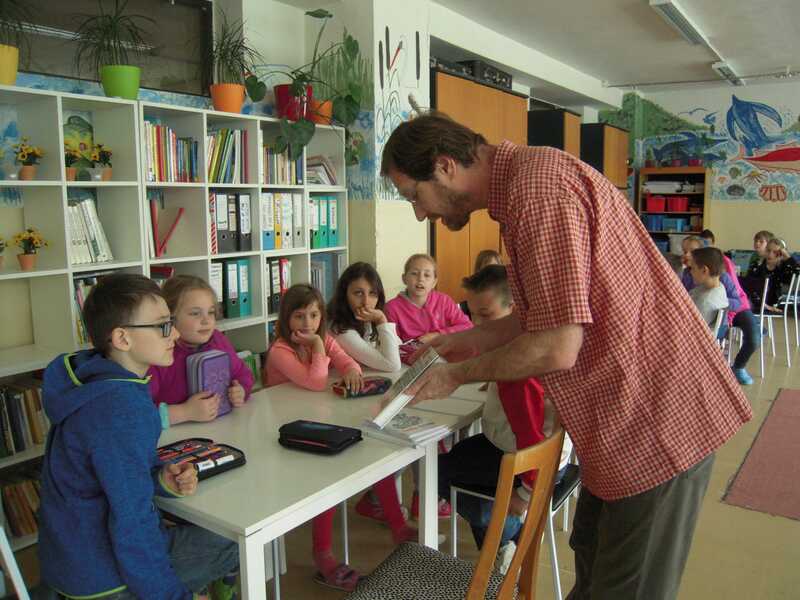 He spent a great deal of time with the children in his workshop and in their classrooms, helping them to plan their silent picture books and design the characters. The older children’s narrative: Montolieu, mon village builds up a visual narrative of their village; each page adding a little more to the final collage. 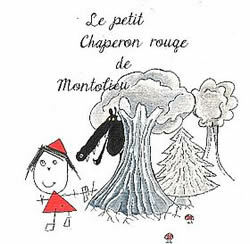 The middle age-range decided that they would like send their own version of a classic French tale, and so created Le Petit Chaperon Rouge. 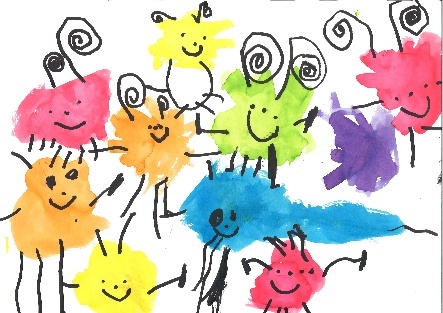 In each case, the children made black and white sketches and ‘Harillo’ chose specific elements of each child’s work and transformed them into a coherent visual story. The youngest class was helped by another local artist, Philippe Aïni, who worked with them in Montolieu’s modern art museum La Coopérative – Collection Cérès Franco to create their silent book: Les bestioles de Montolieu. 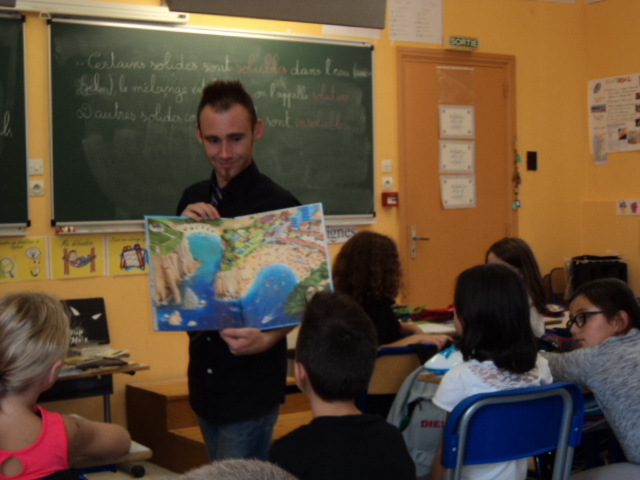 Aïni’s flair for the unusal complemented Harillo’s style and, together with illustrator Nathalie Louveau (who helped the older children to add movement to their characters), the teachers and the association Montolieu Village du Livre – Musée des Arts et Métiers du Livre (who helped the children to bind their books), three very professional visual narratives were created. At the end of six weeks’ very hard work, the children gave a presentation at the Coopérative – Collection Cérès Franco, on the first evening of Montolieu’s children’s literature festival, in front of an audience of over 150 parents, children and the general public. They spoke about some of the silent books they had read and how the visual stories had given them ideas for creating their own wordless picture books to send to the children of Lampedusa. On the second evening, Hasmig Chahinian very eloquently explained how IBBY was created and the work that the organisation has been doing world-wide, highlighting IBBY Italia’s Silent Books: Final Destination Lampedusa. After this Penni Cotton outlined the 6 week project that had been going on in Montolieu and, as she had been taking photos in the classrooms, workshops and museums, was able to tell a visual story of events! Each evening finished in truly French style with apéritifs offered by the parent/children’s association of Montolieu and the Mairie respectively. Thanks were given to everybody who had worked so hard on the project – not forgetting the bookshops, art galleries and local shopkeepers who had all helped to publicise the festival. This project, however, could not have become such a success without the support of IBBY members, many of whom will be attending/attended the 23rd Annual NCRCL MA/IBBY UK Conference, on Saturday 5th November 2016 Froebel College, University of Roehampton, entitled: Marvellous Imaginations – Extending thinking through picturebooks where Penni Cotton will be speaking/spoke about the cultural implications of projects, such as the one in Montolieu, for extending imagination with silent picturebooks, crossing boundaries and helping children to understand more about their neighbours across the seas; and Deborah Soria will be asking/asked: Where are we now? as well as discussing the third Silent Book Collection for Lampedusa. 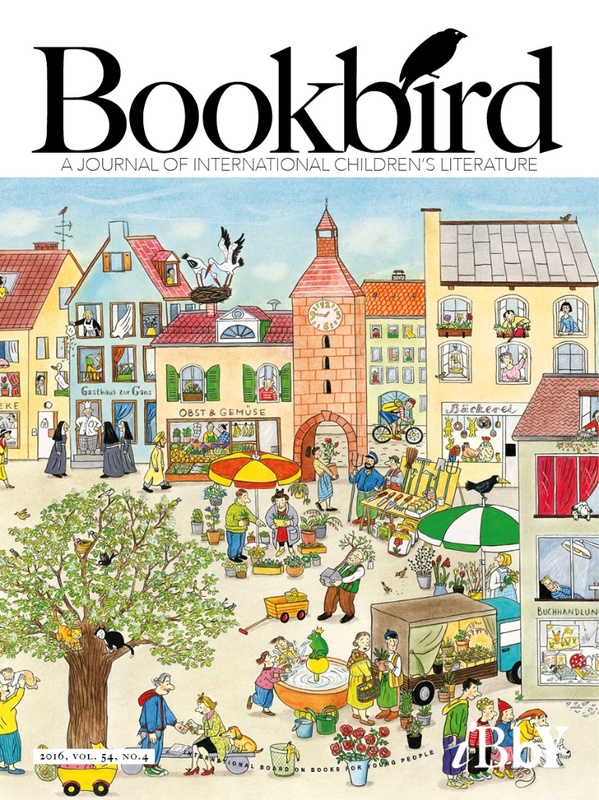 This issue of Bookbird will bring back happy memories of their days 'down under' for all those who attended the 2016 IBBY congress in Auckland, New Zealand. And for those who were unable to be there, it provides a taster of the riches of children's literature from Oceania. Guest edited by New Zealand academic, Anna Jackson, it is an issue bursting with good things. These range from articles about dual language picturebooks in English and Maori, and an examination of a New Zealand reading scheme that portrayed a world familiar to children in 1963, to two articles about Australian young adult fiction, one which discusses trauma in contemporary young adult fiction, and another on fairy tales and myth in contemporary fantasy, and there is also a feature on the merits of judging books by their covers when it comes to Australian children's classics in the twenty-first century. The significant collections housed in the National Centre for Australian Children's Literature are discussed and there are interviews with New Zealand children's poet, Paula Green and author Tulia Thompson. 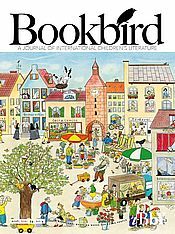 In addition, there are the regular Bookbird sections on 'Books about Books', 'postcard' reviews featuring books from around the world, Focus IBBY carrying news about IBBY activities, and an article about the splendid Bratislava Biennal of Illustration. 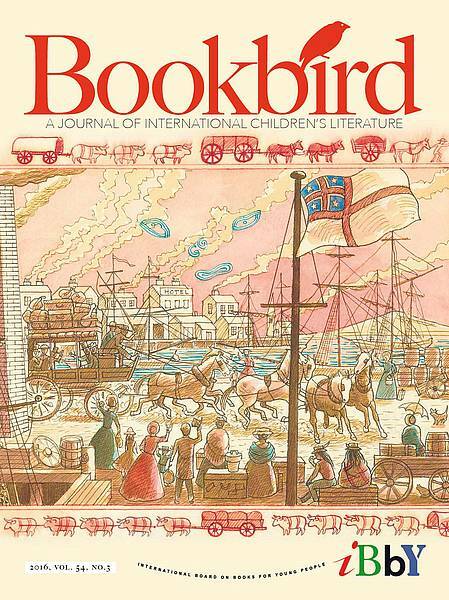 A new and very exciting issue of Bookbird will soon be flying around the world. Here, you can read full-length articles about Hans Christian Andersen Award winners for 2016: illustrator Rotraut Susanne Berner from Germany (the cover illustration is her work), and writer Cao Wenxuan from China. Other articles feature the finalists: Louis Jensen (Denmark), Ted van Lieshout (Netherlands), Suzy Lee (Republic of Korea), Lois Lowry (USA), Pejman Rahimizadeh (Iran), Marit Törnqvist (Netherlands), Mirjam Pressler (Germany) and Alessandro Sanna (Italy). This packed issue includes a feature on the International Youth Library's poignant exhibition about children affected by war, 'Hello, Dear Enemy! Picture Books for Peace and Humanity', and also shorter articles about Pamela Travers' mysterious Moscow book, and about a very special children's literature collection in Turin. 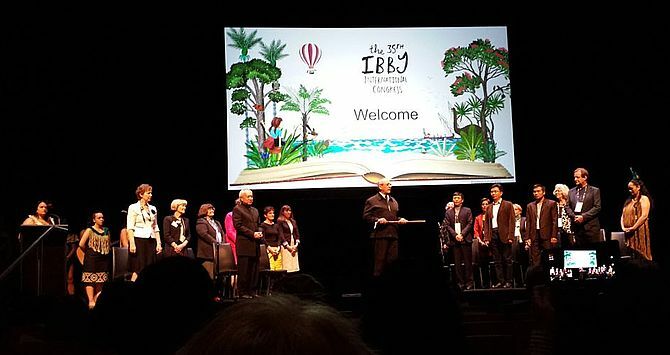 Added to all that you can read news from IBBY, including an account of the 2016 Andersen Jury process. 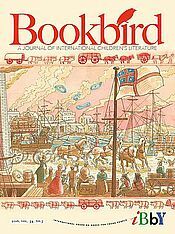 To keep in touch with international children's books, you must read Bookbird.